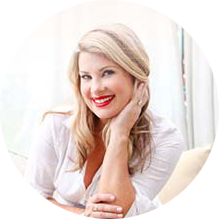 Fall is in the air and I love bringing a little autumn decor to my home. 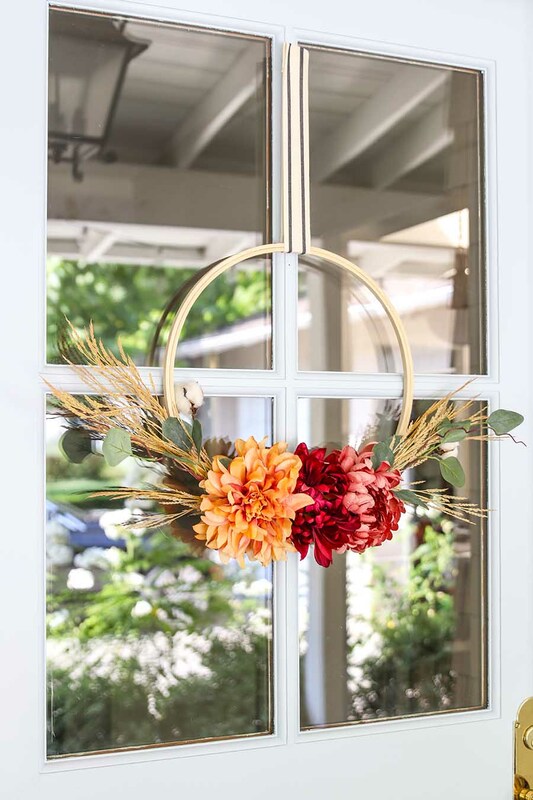 I came up with this fun Fall Hoop Wreath over the weekend and I’m loving the seasonal touch it adds to my front porch! I can’t wait to get some pumpkins in a few weeks, but for now this fall hoop wreath is the perfect seasonal touch. 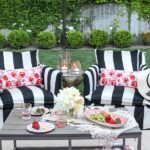 I’m joining some talented bloggers for this fun and creative blog hop hosted by Krista, The Happy Housie! Be sure to visit all the wonderful blogs listed at the bottom. 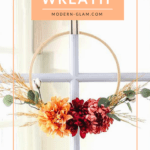 If you missed my Spring Floral Hoop Wreath be sure and check that out by clicking HERE! 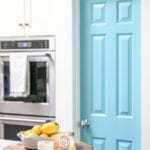 This project was easy and inexpensive. A winning combination, right? 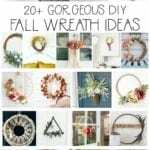 Total cost for this fall wreath was under $30 and I have material left over! You can use any combination of flowers and greenery here. I chose these beautifully fall colored dahlias and mums, but Sunflowers and Hydrangeas are just as beautiful. I also saw some gorgeous fall colored roses at the craft store. For the greenery, I chose this faux wheat because I love the golden color and the texture it adds to the project. The Eucalyptus adds some color without being too heavy. I also added a few cotton stems. The first step in this project is to lay out your design. I put the wheat down first, then the greenery and the flowers on the top. Play around with the layout until you like the look of your wreath. There is no right or wrong way to do this – have fun! 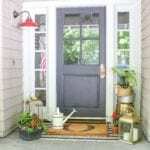 Once you have the placement that you like, start securing the flowers and leaves to the wreath. You may have to take some of the items off and work in layers. You may want to use a hot glue gun to secure some of the items in place. The flowers can be heavy and when hung start to fall downwards – hello gravity! An easy solution for this is to place a dot of hot glue on the back of the wire to hold them in place. 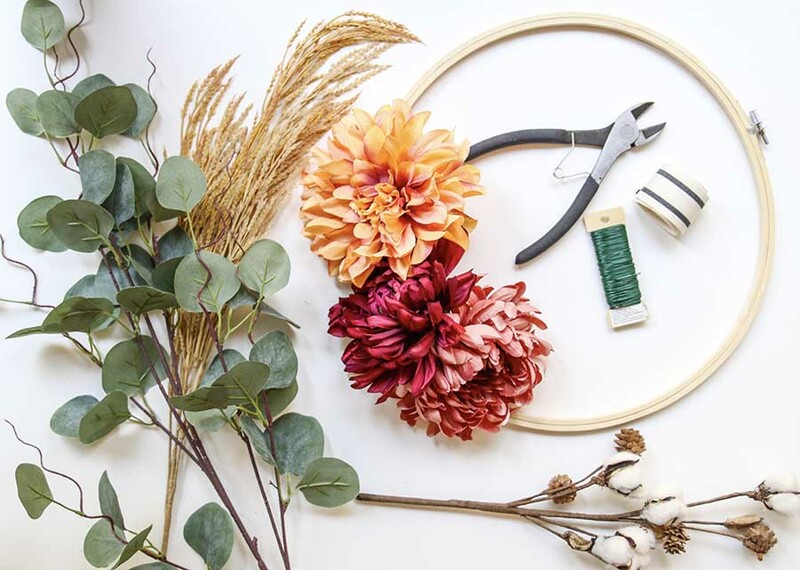 Loop your ribbon around the top of the embroidery hoop and use this ribbon to hang! 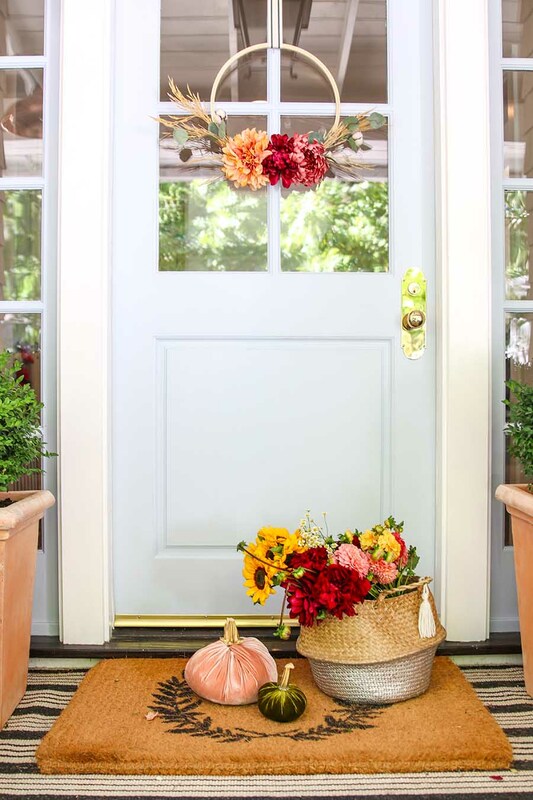 I love how this simple and easy Fall project adds a little touch of Autumn beauty to my entryway! So pretty, Ashley! 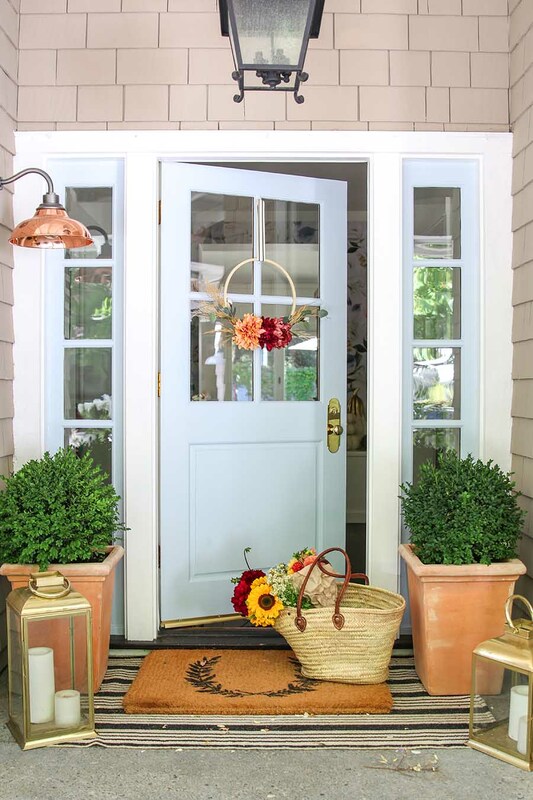 I LOVE these colours – such a pretty and fresh welcome for your door:) Glad you could be on this hop! I love how you picked up the copper from your lamps in your hoop wreath! 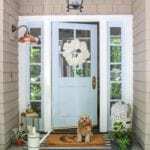 Your porch and door are always so beautiful with all that you decorate it with! You always inspire me, sweet friend! Love the whole combination of wheat and flowers! So so pretty! 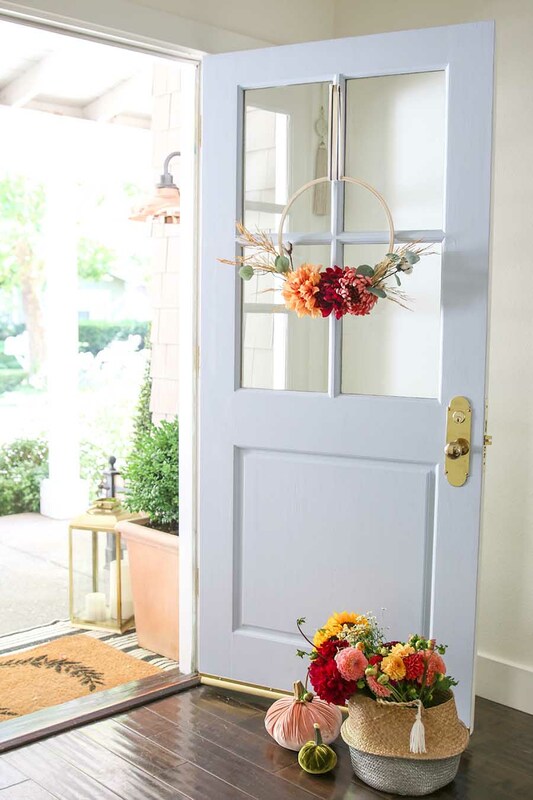 Love the wreath and I like your entryway too! It is looking vibrant & colourful!! What a pretty wreath! I love the colours you chose and the addition of the grass and greenery…it’s so perfect for fall!